A man has appeared on Syrian TV claiming he was bribed to give evidence against Syria to the UN inquiry into the killing of Rafik Hariri. The man, identifying himself as Hossam Taher Hossam, said he was bribed by former Lebanese Prime Minister Rafik Hariri's son Saad. A spokesman for the Hariri family dismissed Mr Hossam's statement. Mr Hossam was an unidentified witnesses who appeared in an interim UN report into the progress of an inquiry. Led by Detlev Mehlis, the interim UN report implicated high-level Syrian and Lebanese officials in the killing of Hariri and 20 others on 14 February. Later this week, five senior Syrian officials are expected to be questioned by Mr Mehlis in Vienna. Reports from Lebanon suggest the officials include the head of Syrian military intelligence, Assef Shawkat, a brother-in-law of Syrian President Bashar al-Assad. Syria has repeatedly denied any involvement in killing. Hossam Taher Hossam, who identified himself to the UN inquiry as a former Syrian intelligence officer, alleged in a 75-minute interview on Sunday night that Saad Hariri met him several months ago and offered him $1.3m to testify against top Syrian officials. He also claims to have been tortured and injected with drugs. The UN investigation team has confirmed he was a witness who had approached the commission with information. A UN statement released in Beirut said the inquiry "does not offer, and has never offered or provided, any compensation in exchange for information". A spokesman for the Hariri family said the allegation made on Syrian TV was "a desperate attempt by desperate people to mislead the investigation and public opinion". A Syrian official involved in the Syrian inquiry into Hariri's killing, Ibrahim Daraji, said on Monday that if Mr Hossam was a key unidentified witness quoted in the UN inquiry, then the UN's case had "collapsed completely". Mr Hossam told Syrian TV that he had been told to tell the UN inquiry that he was close to Assef Shawkat but had never met him. 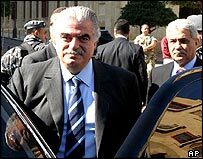 He said that his Lebanese contacts had told him to say Syrian President Bashar al-Assad had threatened the late Hariri. He said he had refused to do this. He told Syrian TV that UN officials had sought to convince him to go to Vienna to testify against the Syrian officials. Rafik Hariri's assassination sparked massive anti-Syrian street protests in Lebanon. The protests, and growing international pressure including UN Security Council resolution 1559, led to the pull-out of thousands of Syrian troops stationed in Lebanon.